The device is capable of extracting soil samples of 100 to 250 ml volume. The damp soil sample is filled into a sieve of 1mm mesh width (included in delivery) and subsequently flushed into the counter flow. Water flow through the spraying nozzle is about 40 l/h (flowmeter and regulating unit left). 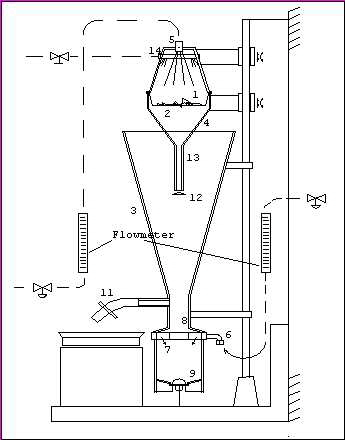 At the same time water is let in from the ground of the device through a perforated ring chamber with a flow of approximately 60 l/h (flowmeter and regulating unit right). This produces a smooth, and upward directed flow that prevents nematodes and finer soil parts from sinking down to the bottom. Heavier parts although will sink down to the bottom of the extractor. Total handling time of one sample is based upon volume and consistency of the soil and lasts 8-12 min. During the rinsing process, counter flow from the bottom continuously persists at about 60 l/h. 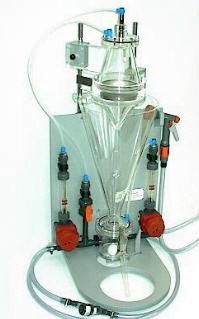 If the whole sample has been rinsed through the sieve before the water level has reached the upper edge of the cone then counter flow should be reduced to 35 l/h. When the water level is nearly the upper edge of the cone the outlet must be opened to let off the water. The nematodes are held back by laboritory sieves with appropriate mesh width. Cleaning of the instrument is a simple process when having opened the bottom valve and using the shower head (included in delivery) to wash up soil adhesions. The device should be placed over a water collecting basin. Mounting at the wall is also possible. The plexiglass construction eases control of cleaness thus preventing carry-over.